The issue is simple really. Instead of creating folders in Visual Studio, I create a directory structure for my project on the file system. How do I include all the folders and files in a project, keeping the structure? If I "Add Existing File" on a folder named Services and navigate to a file in the directory structure .. Services > AccountManagement > CreateAccount.cs, it appears in Visual Studio like so: Services > CreateAccount.cs. I do not want this. I have an entire directory structure worked out already, as I am mimicking our client developers using the same structure for organization. How do I add all the folders and files to the project in Visual Studio? Or do I have to do what most Microsoft users do and "put up with it" and recreate each and every folder through Visual Studio? You need to put your directory structure in your project directory. And then click "Show All Files" icon in the top of Solution Explorer toolbox. After that, the added directory will be shown up. You will then need to select this directory, right click, and choose "Include in Project." You can also drag and drop the folder from Windows Explorer onto your Visual Studio solution window. In Visual Studio 2015, this is how you do it. Right click in Windows explorer on the folder, and Copy on the folder with many files and folders. 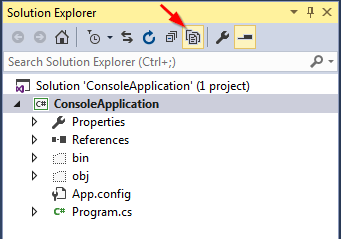 Then in Visual Studio Solution explorer, right click on the destination folder and click paste. Optional add to TFS; Then in the top folder right click and check in to TFS to check in all sub-folders and files. You can use a symbolic link. This makes modifying the file in one project modify it in the other (as it's actually the same file). This has it's drawbacks and pitfalls, but I use it on occasion for duplicate libraries that need different names. Create link in the project folder using the steps above. 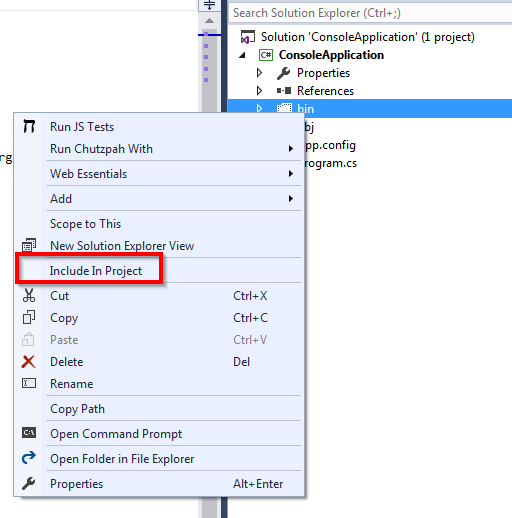 In Visual Studio... select project in Solution Explorer. At the top of Solution Explorer... click the Show All Files button (may need to click it twice if already active). The link will now show in your project... right-click and choose Include In Project. These are the steps I follow and works for a couple different projects. To expand on Yuchen's answer, you can include files and paths as a link. This is not the same thing as adding the existing items because it doesn't make an extra copy in your project's folder structure. It is useful if you want one canonical folder / file etc to be used in a lot of different places but you only want to maintain one version/copy of it. $(Codez) is a Windows Environment variable I defined, you can use the built-in Environment variables in the same manner. The last example group is a bunch of content files I need in the final output. See https://stackoverflow.com/a/11808911/492 and other answers & links there for more on that. 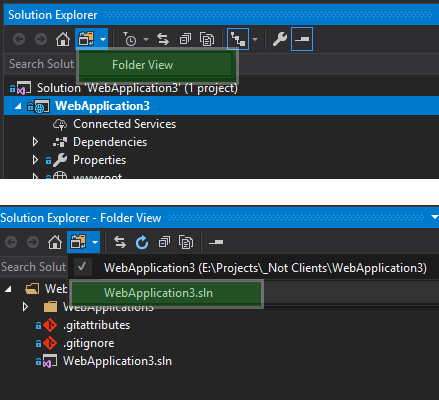 In Visual Studio 2017, you switch between Solution View and Folder View back and forth. I think this is a better option, because it will keep the solution cleaner. I use this to edit .gitignore, .md files, etc. I think I found a way to do this with the Compile Include=".\Code***.cs" What I wanted is to include code recursively under my Code folder. Here is the project file sample. I am hoping to use this to deploy some data files in a Visual Studio Installer project, and it seems to pick up the included files and preserve their paths. As far as I can tell, the only way to do this in VS2010 is akin to the drag and drop method. Right click the solution to which you want to add a project. The application menu will have an add ... item. Opening that, you find that one of the options is to add an existing project to the solution. In the dialog box that opens, navigate to the folder containing the project file for the solution and select it. VS will, as part of importing that project file, also import the entire directory and, I assume any subordinate directories which are part of that project. As this does require an existing project file, it won't be impossible to import a directory tree until that tree has been converted to a project. I found no answer to my satisfaction, so I figured out myself. Here is the answer to you if you want to add external source codes to your project and don't want to copy over the entire codes. I have many dependencies on other gits and they are updated hourly if not minutely. I can't do copy every hour to sync up. Here is what you need to do. Right-click the project name right below the Solution. Then click the "Add", "New Filter", put the name "projA" for projA. Right-click on the "projA", click "Add", "New Filter", enter name "src"
Right-click on the "projA", click "Add", "New Filter", enter name "includes"
Right-click "projA"/"src", click "Add", "Existing Item", then browse to the /root/projA/src to add all source codes or one by one for the ones you want. Do same for projB. Now the external/existing projects outside yours are present in your solution/project. The VS will compile them together. Here is an trick. Since the projA and projB are virtual folders under your project, the compiler may not find the projA/includes. If it doesn't find the projA/includes, then right click the project, select the "Properties". Navigate to "C/C++". Edit "Additional Include Directories", add your projA/include as such "../projA/includes", relative path. One caveat, if there are duplicated include/header files, the "exclude from project" on the "Header file" doesn't really work. It's a bug in VS.
Not the answer you're looking for? Browse other questions tagged visual-studio or ask your own question. How can I add an existing folder structure to my visual studio project (python tools)? C# visual studio how to relocate nuget package folder? How do I add an existing folder to Visual Studio 2010 Express project? How do I add a folder, not a “filter”, in Visual Studio 2013? Visual Studio solution that just points to a folder and shows all sub-folders and files in the solution explorer?